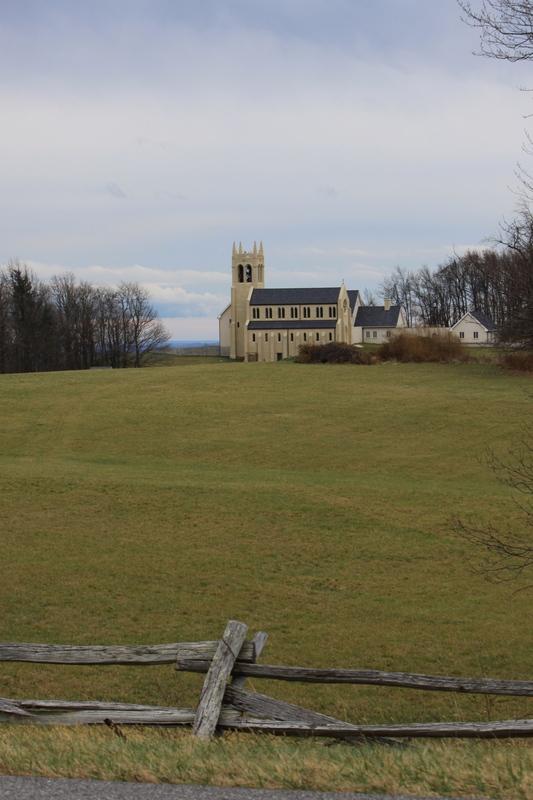 Syon Abbey’s groundbreaking took place in 2002.You’re driving along the Blue Ridge Parkway and then you see it across a huge green field. I didn’t realize it was built so recently. I thought the downed fence in front added some depth to the image. At night I waited for the moonrise and the cloud cover was thick and the air cold. During the day we attempted the 4 kids-simultaneous-smiles for the Christmas card. There were the miniature horses in the field next door, sunlight streaming through their visible breath and the late afternoon light on the stunning flowering pears holding onto their golden and scarlet leaves, then releasing them when the wind blew. But I went out in my robe and clogs in the mid-thirties to catch the flock of Turkey Vultures (I had been calling them buzzards until I looked them up) as they circled and waited in the trees. Fascinating- a bit repugnant at the same time. Streetlights, headlights, moon. Bedford Square. A stripe of cloud by the moon. Always practicing my night photography. Trying to avoid excessive graininess. Enjoying the time off from work to restore. Seems like another era when I look at this shot. Don’t understand why people paint brick. 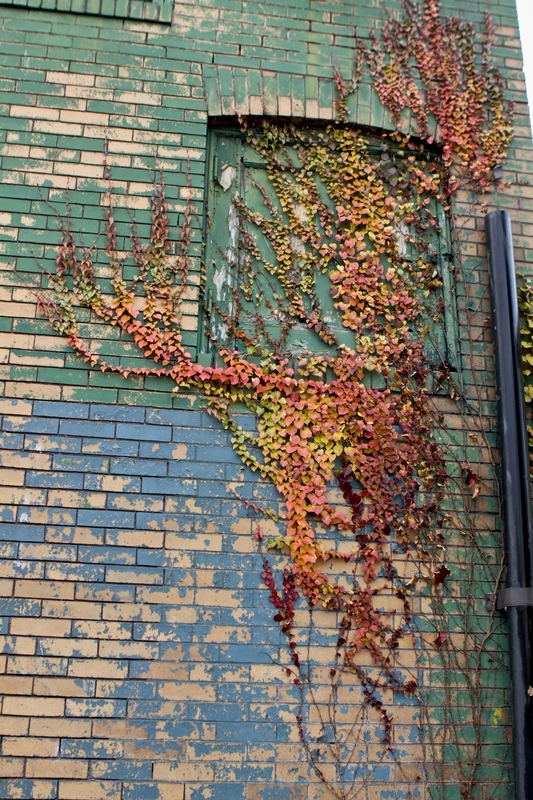 But the peeling paint I found in the back alley was a great background for the autumn vine. Like an artist's palatte, just waiting for me to find it. On Shiloh Street there is a 350 foot tower. Here is a piece of it and the full moon from the impromptu Tuesday night shoot. Just last year I was on the hunt for Inflatable Turkeys. To me this is much more dramatic. Guess this will be the Thanksgiving post. Handheld, RB, no tripod. Propped camera on the side of a telephone pole. Reminds me of a Cape Canaveral image. Not Light Up Night tonight. My friend Ray called. Said there was a huge orange moon on the horizon but by the time I threw on my jeans, wool sweater, hat and scarf, drove up to Mt. Washington, the moon had risen and appeared off white. Clear, cold and windy, met two couples from Minneapolis on their way to the Macy’s Parade in NYC. Ray told them how to drive off the mountain to Fathead’s or Primanti’s on Carson Street. The city lights looked brighter to me than Friday night. It was an impromptu shooting session but a lot of fun. Posting the Radio Tower on Shiloh Street tomorrow. The temperature dropped that twenty degrees they said it would....brrrrr. A clear night. Went to a surprise 40th birthday party Saturday night. Half chocolate/half vanilla. Potomac Bakery made the cake. The icing edge was smiley face yellow. Her husband and sister pulled it off and I hope he takes my friend the birthday girl to the new restaurant Andora she thought she was going to try. 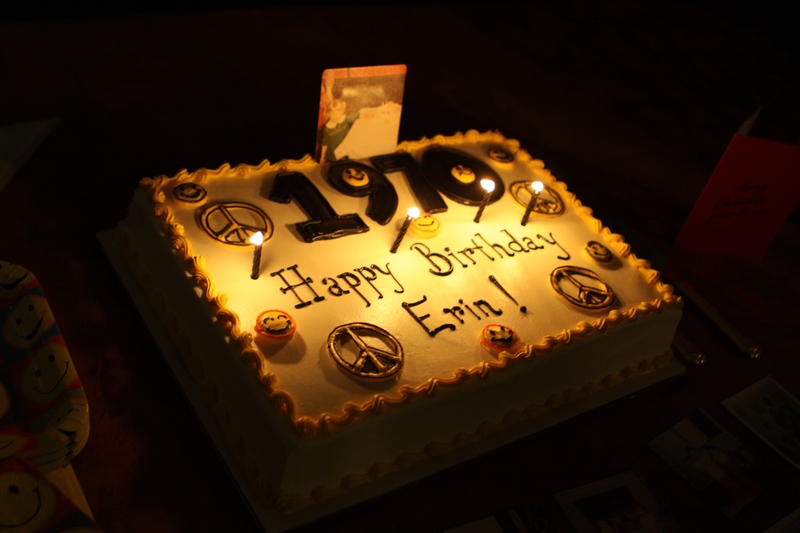 I figured it out- I was a freshman in college when Erin was born! If you want to see what was happening in the world on her birthday, check out the Nov 16, 1970 issue of TIME. Love the challenge of available light photography. 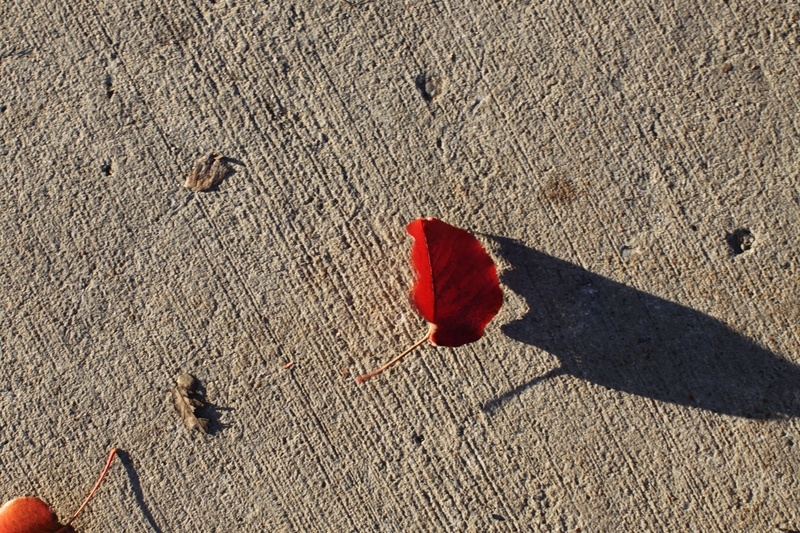 Late afternoon sunlight on a red leaf as it blew across the walk in front of school. Unaltered photo. A true crimson red. if you wait long enough, the wind blows leaves across the concrete. 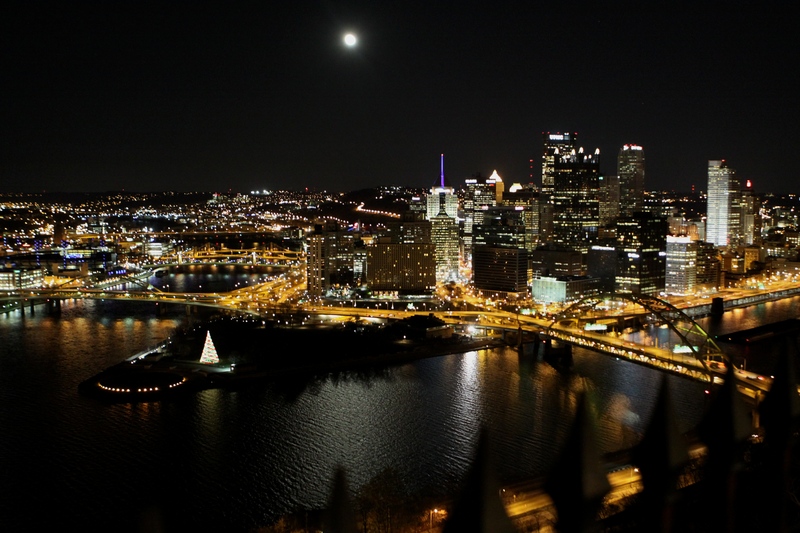 From the the sidewalk by the Monongahela Incline. Not the usual view. 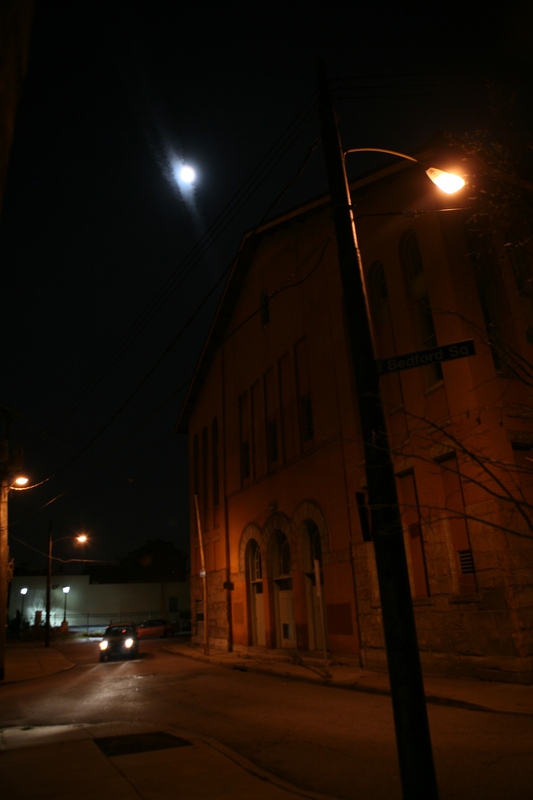 Drove up Sycamore Street after the Madwomen in the Attic Poetry Reading/ Party at WYEP on the South Side. Easy to park as it was after 10 PM. I missed the fireworks. 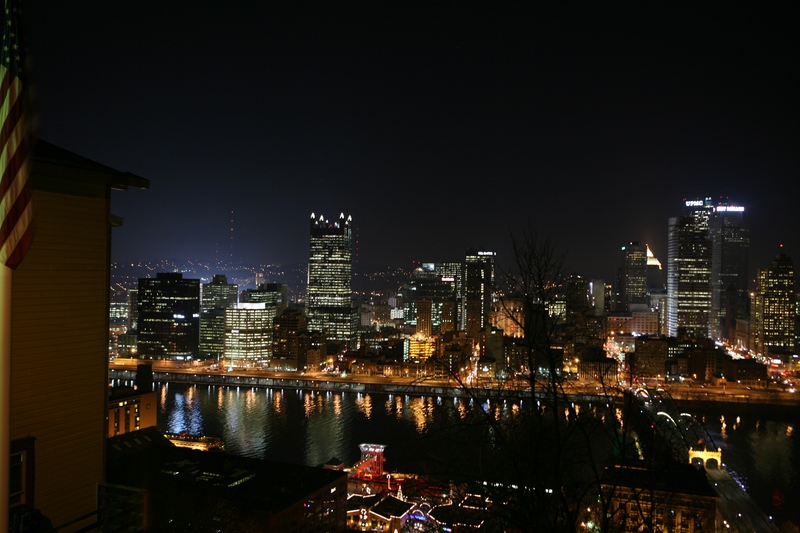 Walked up and down Grandview and took a series of shots of Light Up Night, wishing I had taken the tripod and cable release.